Lemon oil is a good remedy for increasing the lustre of dull skin. Kasturi Tumeric is an Ayurvedic herb which helps brighten the skin. It is a pure and mild body wash enriched with Wild turmeric and zesty Lemon. Ancient Living Turmeric Lemon Body wash is a pure and mild body wash enriched with Wild turmeric and zesty Lemon. Lemon oil is a good remedy for increasing the lustre of dull skin. Kasturi Turmeric is an Ayurvedic herb which helps brighten the skin. It is an anti-inflammatory herb known for its purifying action on the skin. 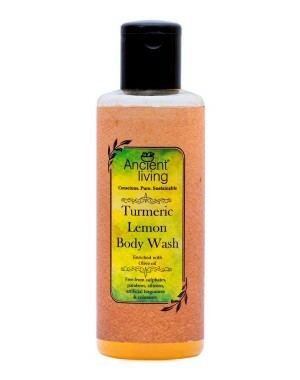 Its gentle lather washes off impurities and germs while lemon clarifies the complexion. Olive oil is rich in vitamins, minerals, and fatty acids; it nourishes, rejuvenates and protects skin. Vitamin E oil is a natural anti-inflammatory agent and anti-oxidant which makes skin soft and smooth. This caring formula ensures that your skin is moisturised and cleansed without drying the skin.